It's been three years since the debut album from The Treatment was released on Spinefarm (it was originally released a year earlier on the small Powerage label), and since then we've just had the 2012 covers EP to keep fans happy. The band haven't been sitting around doing nothing since then though - they seem to be permanently on the road with regular tours of the UK, Europe and other parts of the world. They've had support slots with the likes of Alice Cooper, Slash, Airbourne and KISS/Motley Crue and have been making a good name for themselves as a great live band. Now their second album is finally here. Fans who saw them late last year supporting Airbourne or at Hard Rock Hell will be familiar with several of the tracks on the new album - "Emergency", "The Outlaw" and "I bleed rock & roll" have all been part of their live set for some time. The album comes in a couple of different versions - the standard album, or the limited version. The limited version gives you the same 13 track album plus a bonus disc with four additional songs and two acoustic versions, so is bound to appeal to fans. The album kicks off with "I bleed rock & roll", and right from the start one of their big influences is obvious from the opening guitar piece which sounds like it could have come from any early ACDC album. By this point some ACDC fans will be ranting and calling them ACDC copycats and so on , in exactly the same way we've seen with Airburne, but The Treatment aren't ACDC clones. Yes they use a few guitar riffs that could come from an ACDC album, but so what - they also add other influences such as Def Lepaprd, and their own sound, and it's a real good-time party feel that they bring to the music. The stand-out tracks on the album are "The outlaw", "I bleed rock and roll", "Emergency" and "Don't look down" all of which are great tracks. The whole album is very good, but it's these tracks that stand out as being even better than the others. It seems almost mandatory for rock bands to include a ballad on an album and The Treatment go along with this rule including an acoustic ballad on the album - "Unchain my world". It's very good and allows Matt to show off another side of his voice. If you opt for the 2 disc version then the extra songs are definitely worth the extra pound, with "She does it right" being my favourite track on the second disc. 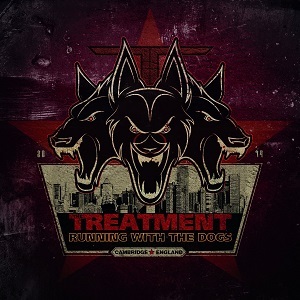 If you're a fan of Airbourne, ACDC and early Def Leppard then you really should check out The Treatment. Certainly when they toured with Airbourne they went down very well with Airbourne's fans and I'm sure this album will win them even more fans. 11. What is there to say?